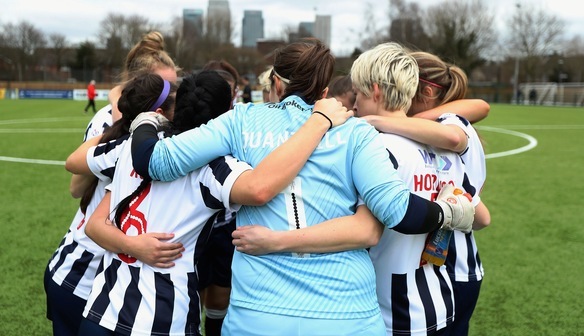 Charlie Devlin scored the winning goal on her debut, as Millwall Lionesses claimed their first win in the FA Women's Super League Spring Series by defeating Everton 2-1 at home. Devlin signed on loan from Arsenal this week and her second-half strike should do wonders in helping to raise her new team's confidence, although Everton will wonder how they came out of this with nothing. The Lionesses took the lead after 21 minutes when Ella Rutherford won back possession around 25 yards from goal before crashing in a superb strike via the post. Everton were able to hit back when Jordan Butler tripped Emily Hollinshead in the area, and Claudia Walker was just about able to beat Sarah Quantrill from the penalty spot. Danielle Turner then forced a good save out of Quantrill early in the second half, before the Millwall keeper tipped Gabby George's header wide following a good cross from Turner. Everton were doing most of the pressing, but Millwall regained the lead against the run of play when Leanne Cowan sent in an excellent low cross that Devlin smashed into the top corner. The Toffees continued to be frustrated despite their dominance, with Quantrill producing another excellent save from Turner in the 88th minute. “It was a great way to start – the girls have been good and we had a game plan that we stuck to. Everyone has done what they were told to do and all the girls were brilliant out there. “It was nice to cap it with a goal as well, I just try my best, really, and hope for the best and it was a great ball in by Leanne [Cowan]. “Everything was on it and I just had to get a toe on it or something and luckily it went into the top corner. “Everton were quality; we know they're a good side and it was a real challenge today that the girls put 110 per cent into, so it was a good win for us. “It is frustrating not getting the ball, but we got the goal, we had a job to do and we just saw the game out. “As a team, we're devastated with the performance because it wasn't good enough all round in the first half. “Going back to the Liverpool game, we dominated them as well, so it was a bit more frustrating today to come to Millwall and get the defeat, but we'll look again on Tuesday and see what we've done wrong today. “We had our chances, that's the thing, and you know in a game of football that you've got to put the ball in the net. “We had plenty of chances and it's just about being more clinical in future. “It was a sloppy goal that they scored to go ahead – it was a mistake on our behalf and it's harder to pick yourselves up and try to get that goal back.